28 January 2016 - An enjoyable evening was had by club members on their visit to Morecambe and Heysham Soroptimists Friendship Evening in Bare. Origami was the theme of the night and everyone was taxed with making an origami Crane! Shall we say some cranes were better than others, but we all got there in the end. The food was delicious and club members even won two raffle prizes, the money from which was going to WaterAid an international charity that transforms lives by improving access to safe water, hygiene and sanitation, a very worthy cause. A great evening with an opportunity to catch up with friends old and new, what more could we ask? 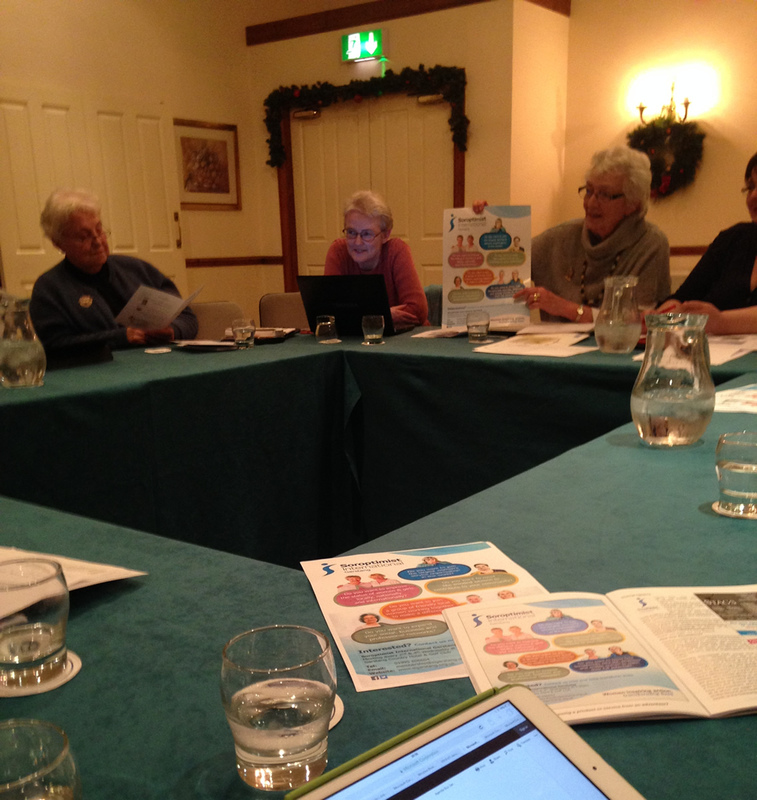 27 January 2016 - The January social meeting found us not only listening to but actively participating in a very informative presentation from Judith Grocott on 'The Role of the Federation Councillor'. There was lots of interaction, questions and ideas raised and everyone went away knowing a lot more about how things work than they did at the start. 13 January 2016 - After what seems like a long break, the first club meeting of 2016 proved a very busy one for members. 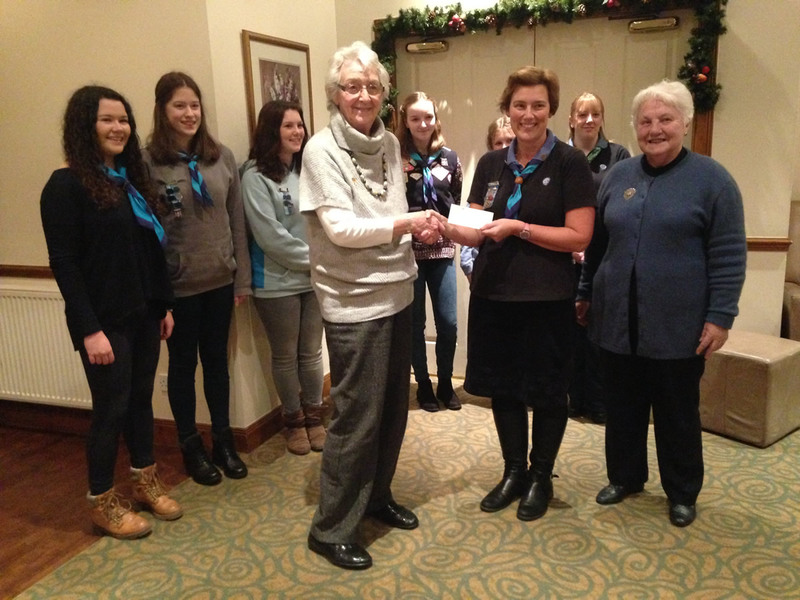 At the start of the meeting Presidents Nora and Hazel handed over a cheque for £250 to 1st Garstang Girl Guides as a contribution towards their visit to Switzerland later this year. Next a collection of foodstuffs was assembled for the Salvation Army food bank in Preston. But the main excitement of the night was the arrival of the recruitment posters for new club members – we had been talking about these for a while and they had finally arrived! The advert mirroring the poster had been seen by members (and the Guiders) in the Garstang and Over Wyre January editions of the Focus Magazine (Green Book) and much admired. So everyone was keen to get distributing – one will be coming to an area near you soon. Check it out and please do give us a call or pay us a visit if you are interested in joining. I hope you all had a wonderful Christmas with lots of presents. 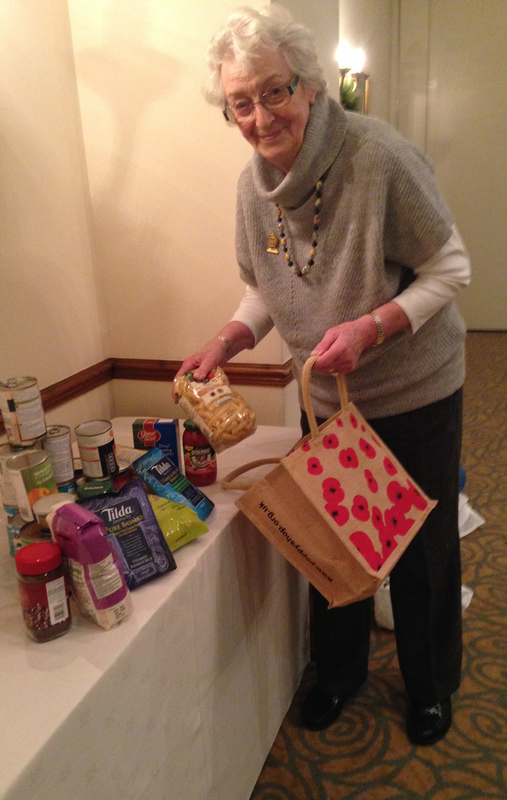 Garstang Soroptimists are still filling packs for the Backpack Project, which provides the essentials for a child in Malawi to attend school and gain an education (which we all take for granted), and so give them an opportunity to escape from a life of poverty. We have sent over 150 filled backpacks so far, and are hoping to reach the 200 mark soon. If any children received nice new backpacks for Christmas, would you please let us have your old ones to send to a child in real need? It will make a difference that could change their life. Thank you for all your support in the past - Garstang Soroptimists value the partnership with Forton School which is helping to make this project such a success. In addition to the empty backpacks, our immediate needs are for clothing for young children (ages 4 to 7) and flipflops or sandals for older ones (ages 10 to 14) so Garstang members will now be hunting these out. If you like what you see, please click to share with your friends!